Freshers’ Week is essentially seven days of orientation for first year students during which they learn how to be students both academically and socially. I’m not going to lie: it was a strange, strange week. I’m a third year college student back in the States, which means that I’ve already been through the standard discussions about racial diversity, asking consent, and fire safety. Everyone in the room felt so young and it felt weird to be constantly asked if I was a freshman as well. The students in my particular program are in a unique position: we know how to be students, just not how to be students at Oxford. There’s a fine line there that’s hard to describe, but it’s definitely there. Even stranger than this phantom fresher feeling was the fact that the college itself sanctioned events relating to and centering around alcohol. Back home that would be illegal because the drinking age is 21, but here it is obviously not a problem because the drinking age is 18. The college led pub crawls, organized club nights, and had a fully stocked bar at our bop. Perhaps this has just been my experience, but here it feels like there’s less pressure to drink to get drunk; instead, people drink to have a good time or to be social at relaxed pubs. Speaking of bops, they’re basically my new favorite thing. A bop is a party that a college will host, usually in their Junior Common Room. Each one has a different theme that dictates what kind of costume you decide to where. The goal is make the best costume by spending the least amount of money on it, so you can imagine the chaos and fun that ensues. Our theme was to dress up as something that starts with the first letter of your first name. 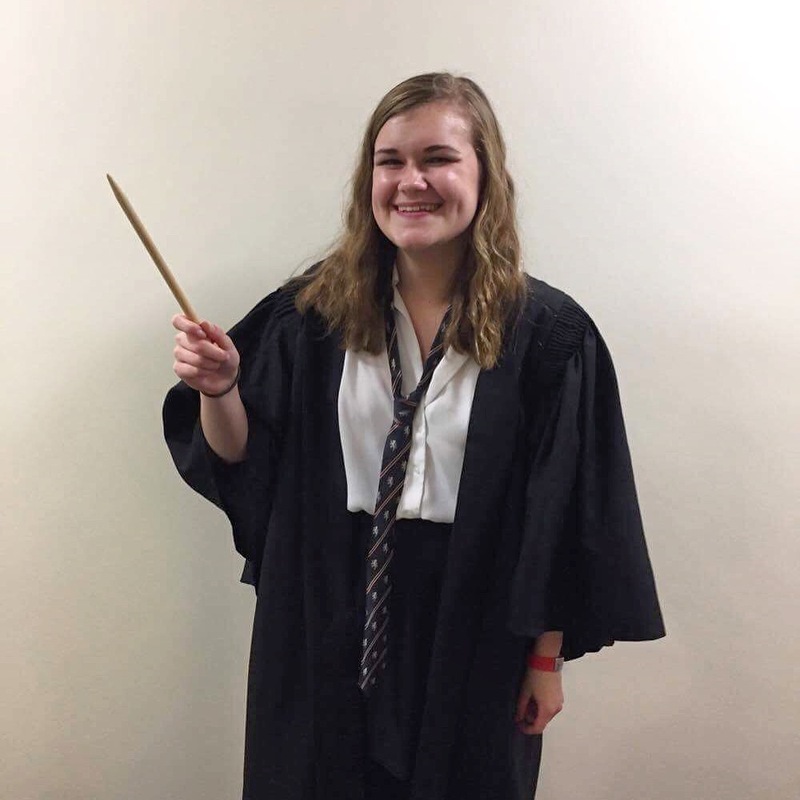 Naturally, I dressed up as Hermione. The bop was a great event to end Freshers’ Week with, especially because the name-centric theme helped me learn more people’s’ names! Last but not least, we come to the dreadful part of Freshers’ Week: what is fondly called the freshers’ flu. Lectures this week were a sea of sick, coughing students all chugging water and as much Vitamin C as they possibly could. The lack of sleep coupled with mountains of course work certainly doesn’t help– but we push through! Whether or not you’ve experienced a Freshers’ Week of your own, I hope you’ve enjoyed this little jaunt into mine! It’s certainly a week I won’t forget. Have you ever experienced a Freshers’ Week? Been to a bop? What would you have dressed up as according to my bop’s theme? Let me know in the comments section below! When I studied abroad (Sussex Uni in Brighton), my fresher’s flu lasted a month, ugh! Luckily I avoided it this year (came back to study my Master’s). I loved Freshers Week, most of the friendships I made then lasted the whole year or longer! I’ve started college recently, and we’ve been talking about Fresher’s Week all over the world in my English class. It was nice to hear how you’re doing! Here, our Fresher’s Week actually lasts the entire year haha It’s called “praxe”. We have activities every day during the first two weeks, and then it becomes twice a week. What we do depends on the school. It has been cool so far, but sometimes the people organizing it (older students) really push it. I never got a chance to study abroad. The closest I got was a spring break trip for one of my classes where we went to France and Italy. But when I first started college there were orientation weekends where the freshmen would go and spend the weekend there, get to know campus, take tests in math and foreign languages to determine if you tested out of certain requirements or not, etc. But it does not sound anywhere near as fun or intense as fresher’s week. I loved freshers so much that I went every year I was at uni! It sounds like you had a great time. I went out for my friends birthday a couple of weeks ago and ended up at a student night – and ended up getting freshers flu! I thought I’d be immune by now hahaha! We sort-of have bops? We have a monthly karaoke party where we can choose to dress as a musician from a certain era. Most don’t dress up, but it’s fun just singing and listen to our loca director sing.